While “The Greatest Showman” isn’t performing as well as Fox might have hoped, the studio still has reason to smile this Christmas weekend as its major awards contender, “The Post,” is off to a great start in limited release. 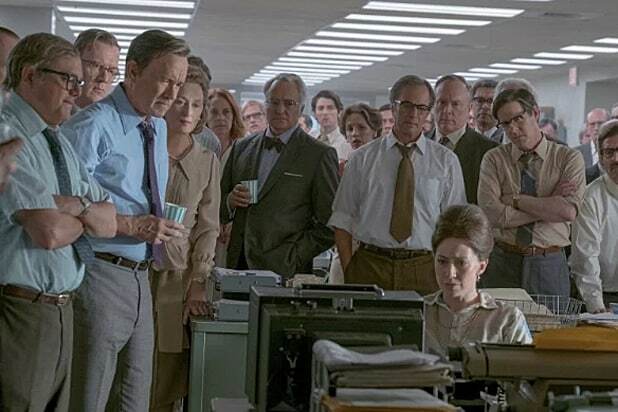 Steven Spielberg’s recounting of The Washington Post’s acquisition and publishing of The Pentagon Papers opened on nine screens this weekend and is looking at a four-day start of $715,000, good for a per screen average of just under $80,000. The film has had glowing reviews with an 86 percent score on Rotten Tomatoes. “The Post” stars Tom Hanks as famed WaPo editor Ben Bradlee and Meryl Streep as the paper’s owner, Kay Graham. Bob Odenkirk, Tracy Letts, Bradley Whitford, and Sarah Paulson also star. Josh Singer, who won an Oscar for his script for “Spotlight,” wrote the script with Liz Hannah. Meanwhile, two other awards contenders, Focus Features’ “Darkest Hour” and Fox Searchlight’s “The Shape of Water,” expanded nationwide this weekend. “Darkest Hour,” Gary Oldman’s biopic of Winston Churchill, made $4.1 million from 806 screens to bring its total to $8.7 million. “The Shape of Water” expanded to 726 screens and made $3 million to bring its total to $9 million. A24’s two titles, “The Disaster Artist” and “Lady Bird,” made $907,000 from 517 screens and $1 million from 402 screens respectively. “Disaster Artist” has a total of $15.7 million while “Lady Bird” sits at $28.3 million. NEON/30WEST’s “I, Tonya” expanded to 37 screens and made $712,000, bringing its total to $1.3 million. Sony Pictures Classics’ “Call Me By Your Name” expanded to 114 screens and added $850,000 to bring its total to $3.1 million. Finally, two other new limited releases hit theaters in L.A. and New York this weekend: Entertainment Studios’ “Hostiles” and Sony Pictures Classics’ “Happy End,” both rolling out on three screens this weekend. Estimates have “Hostiles” making $23,000 over the four-day weekend for a PSA of $7,600, while “Happy End” made $23,800 for a PSA of just under $8,000. “Hostiles” stars Christian Bale as a U.S. Marshal tasked with escorting a tribe of Native Americans to their ancestral home to give their dying chief (Wes Studi) a proper burial. Rosamund Pike and Jesse Plemmons also star in the film, which is written and directed by Scott Cooper. The film currently has a 67 percent RT score. “Happy End” is the latest film from “Amour” director Michael Haneke, following a bourgeois family and their barely veiled tensions amidst the background of Europe’s refugee crisis. “Amour” stars Isabelle Huppert and Jean-Louis Trintignant star. The film has a 64 percent RT score. Awards season is now in full swing, and with the Golden Globes nominations on Monday came a flood of statements from nominees. They're honored, grateful, and thrilled, and might just be practicing for their acceptance speeches. We've gathered up several reactions below. Nicole Kidman, nominated for Best Actress in a Limited Series or Motion Picture Made for Television for "Big Little Lies"
"We are all aware of how rare it is for a show and it's cast to be honored in such a huge way, and we are all incredibly grateful. Thank you to the Hollywood Foreign Press for giving the show so much love. It was made with love, guided by the incredible David E. Kelley and Jean-Marc Vallée as well as my partners in passion Reese Witherspoon, Per Saari and Bruna Papandrea. The character Celeste is so precious to me and the recognition is deeply appreciated." Meryl Streep, nominated for Best Performance by an Actress in a Motion Picture, Drama, for "The Post"
Carlos Saldanha, nominated for Best Animated Motion Picture for "Ferdinand"
"This is just wonderful news! On behalf of our amazing team, I am so grateful to the Hollywood Foreign Press for nominating 'The Breadwinner.' Across three countries and over four years, this film has been our passion. I have been deeply moved by the generosity of our cast, crew, producers and financiers in helping bring Parvana's story to the screen. We are truly honored to be in the company of our fellow nominees at this years Golden Globe Awards." Hans Zimmer, nominated for Best Original Score for "Dunkirk"
James Franco, nominated for Best Performance by an Actor in a Motion Picture, Comedy, for "The Disaster Artist"
Emma Stone, nominated for Best Performance by an Actress in a Motion Picture, Musical or Comedy, for "Battle of the Sexes"
"Thank you to the HFPA for this honor and thank you beyond measure to the one and only Billie Jean King. She is a brilliant, brave and game changing human being and I wish to be half the woman she is someday. I share this with the whole cast and crew of BATTLE OF THE SEXES, a film I feel very lucky to have been a part of." Liz Hannah and Josh Singer, nominated for Best Screenplay for "The Post"
Frankie Shaw, nominated for Best Performance by an Actress in a Television Series, Musical or Comedy, for "SMILF"
"I can’t believe it! What started as a little short film I shot in my friends bedroom turned into this. I am so honored for the show to be recognized and for our name to be up there with all of these amazingly creative and talented people. Thank you to Showtime for believing in us, and thank you thank you to the Hollywood Foreign Press!!!" Sally Hawkins, nominated for Best Performance by an Actress in a Motion Picture, Drama, for "Shape of Water"
Gary Oldman, nominated for Best Actor in a Motion Picture, Drama, for "Darkest Hour"
Guillermo del Toro, nominated for Best Director of a Motion Picture for "Shape of Water"
Claire Foy, nominated for Best Performance by an Actress in a Television Series, Drama, for "The Crown"
Tom Hanks, nominated for Best Performance by an Actor in a Motion Picture, Drama, for "The Post"
Liev Schreiber, nominated for Best Performance by an Actor in a TV Series, Drama, for "Ray Donavan"
"I am so grateful to the Hollywood Foreign Press for continuing to recognize our work. None of it would be possible without the extraordinary cast & crew of this highly functional dysfunctional family. Big love and gratitude my lady Macbeth and the greatest scene partner on God’s green earth, Paula Malcomson." Martin McDonagh, nominated for Best Director of a Motion Picture for "Three Billboards Outside Ebbing, Missouri"
Steven Spielberg, nominated for Best Director of a Motion Picture for "The Post"
Ridley Scott, nominated for Best Director of a Motion Picture for "All the Money in the World"
David Harbour, nominated for Best Performance by an Actor in a Supporting Role in a Series, Limited Series or Motion Picture Made for TV for "Stranger Things"
"Thank you HFPA for the great honor of being nominated for a supporting tv actor Golden Globe award this year, and for nominating STRANGER THINGS in the Best TV Drama category as well. It's gratifying to be seen for my work and and to be in a category with such esteemed colleagues. The work I do on ST has been the most satisfying of my career, due to the brilliance of all departments but of course most especially the writing and directing of the Duffer Brothers and the directing and producing of Shawn Levy and Dan Cohen and the generous license to play that Netflix gives us. My co-stars are all so inspired and inspiring to work with on a daily basis, and I surely wouldn't be nominated without the special chemistry I had this past season with Millie, Winona, Finn, Noah, Sean, Paul and all the rest. Their work makes me shine. They make it easy for David and Hopper to look good." Judi Dench, nominated for Best Actress in a Motion Picture, Musical or Comedy for "Victoria and Abdul"
"The Golden Globes, hooray! What wonderful news on such a snowy day in London." Jonny Greenwood, nominated for Best Original Score for "Phantom Thread"
"I’m honored to have my music in Phantom Thread nominated alongside such talented film score composers. This is the fourth film with my friend Paul Thomas Anderson. It’s a happy and productive partnership, one where I’m given a ridiculous amount of freedom to write music and explore ideas with him. I’m very glad to see this relationship recognised by such a nomination." Alexandre Desplat, nominated for Best Original Score for "The Shape of Water"
Aaron Sorkin, nominated for Best Screenplay for "Molly's Game"
"Jessica and I are thrilled to be representing Molly’s Game at the Golden Globes. By recognizing our work the HFPA has recognized the work of roughly two-hundred technicians, carpenters, painters, designers, editors, engineers, musicians and actors—particularly Idris Elba and Kevin Costner-- to say nothing of our producers and STX. I’d like to send a personal congratulations to Jessica, who straps the movie to her back in the first scene and doesn’t put it down until the end credits roll and who brings this unique movie heroine to spectacular life. Thank you to the HFPA and congratulations to all the nominees." Daniel Kaluuya, nominated for Best Performance by an Actor in a Motion Picture, Musical or Comedy, for "Get Out"
William H. Macy, nominated for Best Performance by an Actor in a TV Series, Musical or Comedy, for "Shameless"
Michelle Williams, nominated for Best Performance by an Actress in a Motion Picture, Drama, for "All the Money in the World"
"Thank you so much to the HFPA for this honor. I am thrilled to share this with my dear friend, Ridley Scott, and my new friend, Christopher Plummer. This has been quite the journey that I am proud to be a part of. Also, a big congratulations to Hugh Jackman and my fellow castmates from THE GREATEST SHOWMAN." Robert de Niro, nominated for Best Performance by an Actor in a Limited Series or Motion Picture Made for Television for "The Wizard of Lies"
"I am very proud of the work done by everyone associated with the “Wizard of Lies.""